Paul Salmons, Programme Director of the UCL Centre for Holocaust Education, leaves UCL at the end of November to establish an international consultancy service for Holocaust museums, educational projects, and study visits to authentic sites. This will include work as curator and pedagogue on the major international travelling exhibition Auschwitz: Not long ago. Not far away, amongst other projects. Paul will continue to have a close affiliation with the Centre and will collaborate with us in a number of ways, consulting on a number of projects. 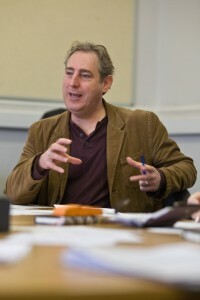 For the past ten years, Paul has played a critical role in ensuring that the Centre’s pedagogical programmes are uniquely responsive to the findings of rigorous historical and school-based research. More than 10,000 teachers have directly benefitted from the Centre’s innovative programmes and it has developed into a world-leading organisation in the field of Holocaust Education. The Centre looks forward to continuing to work with Paul as it deepens and extends its training, continued professional development, masters and Beacon School programmes. Ongoing work of the Centre will strive to ensure that every school student develops meaningful knowledge and understanding of the Holocaust and is able to reflect critically on its contemporary significance. We wish Paul all the best for the future.